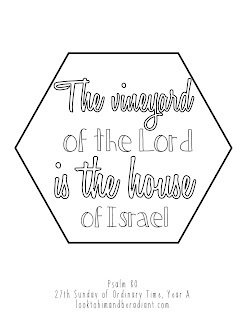 I'll post coloring pages of the Psalms once a month, so stay tuned! You can find the August Coloring Pages here, and the September Coloring Pages here. You might also like our Sweeter than Honey theme resources (folder covers, logo, signs, etc. 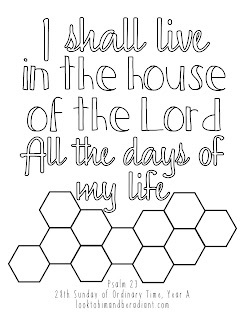 ), Sweeter than Honey theme decorations, and St. Abigail and St. Ambrose patron Saint coloring pages. Pauline Books & Media provided me with a copy of Jesus Speaks to You in exchange for an honest review. Adult coloring books might be all the rage, but they are not all made equally. 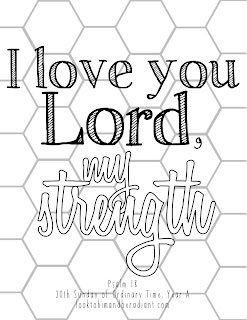 There also are many religious/Biblical/inspirational coloring books on the market, but I haven't been impressed by most of them I have picked up. My expectations were greatly exceeded by this book for coloring and prayer called Jesus Speaks to You, full of beautiful images of Christ and themes from Scripture. Part of a series of Sacred Art coloring books, this addition joins Our Lady's Garden, Windows into Christ, and Scripture Illuminated all from Pauline Books & Media. Not only is the art beautiful and varied on each page, but the heavy weight paper and large page size (11x11") makes it enjoyable to get creative with all kinds of media- crayons, colored pencils, pens, and markers. I really like how the art is cohesive throughout the book, creating themes and patterns that build on one another. Each page is lovely and unique. Each two page spread has a quote of Jesus' words from one of the Gospels, but there are also many spots with enough blank space that you could use it for your own journaling, reflection, or lettering. To see a sample of the art, you can download a free page from Our Lady's Garden here. 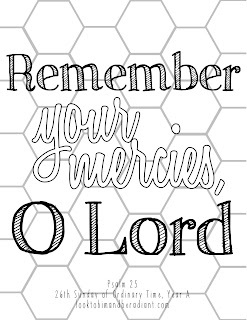 You might not consider yourself an artist, but I think there can be many benefits to slowing down, practicing your God-given creativity, and using art like this to help you pray. After all, the Church has been using stained glass windows, statues, mosaics, and more to educate Her people and help them meditate upon truths of the faith- why can't images like these do the same? This was a happy church-rummage-sale find! Who can turn down a biography of John Paul II? (The answer is not I.) This look into the life of JP2 was originally published in Italian by a journalist known for other Catholic biographies. It was completed shortly before the Pope's death, which lends a different perspective than many biographies looking back on his life and impact. This book shared details about the events and tragedies of John Paul childhood and youth, as well as how they formed his faith and character. It also outlined his unlikely rise to the papacy and his profound impact on the world. If you are looking for a short biography on the life of St. John Paul II, I would highly recommend Jason Evert's John Paul the Great: His Five Loves. It remains my favorite book about JP2, but I am happy to add Allegri's book to my collection as well. Over the summer, I was having a discussion with my siblings about books we read as kids that stuck with us. Out of nowhere, I thought about a book I read in 4th or 5th grade that was short and simple, but had a thought provoking story I could still remember many details about. After a little searching, I ordered myself a fresh copy of The Green Book and reread it to see how my memories aligned with the plot. In this short (80 pages) novel, Earth is a dying and a spaceship of people set off for a distant planet that may or may not be habitable. The group includes a father and his two young daughters. The survivors must pack provisions and supplies for their journey, leaving very little room for anything personal or sentimental. Each person can bring only one book, and young Pattie's choice becomes an important part of the plot. While this book is not classic literature, it is an interesting story. I think that it would make a phenomenal read aloud for 4th-5th graders, especially when coupled with discussion on the choices and actions of the characters. It would work well as an introduction to Science Fiction and maybe peak a child's curiosity for other great books from the genre like A Wrinkle in Time or The Giver. I reread this book one weekend at the end of the summer, and was reminded of what a wonderful storyteller author Rachel Hauck is. 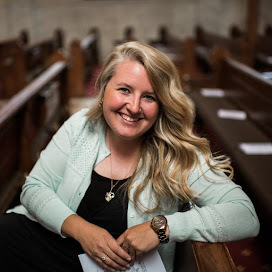 Her books fall into the category of Christian Romance, but the depth of her plots and character development set them apart from many other novels you would find in that section of the bookstore. The Wedding Shop is part of a loosely connected series of books that stand well on their own, including the Wedding Dress and the Wedding Chapel. There is some character crossover, so reading all of them gives you little glimmers of connections, but you can pick up any of the books and start reading there. What I love most about these novels is the detailed weaving together of stories. Each book has several important characters that span over generations. While their lives are interesting stories by themselves, the beauty is found when it is revealed how they are all connected. The Wedding Shop brings together modern day retired Air Force Captain Haley and 1930's Wedding Shop Owner Cora, who though remarkably different have similar dreams. 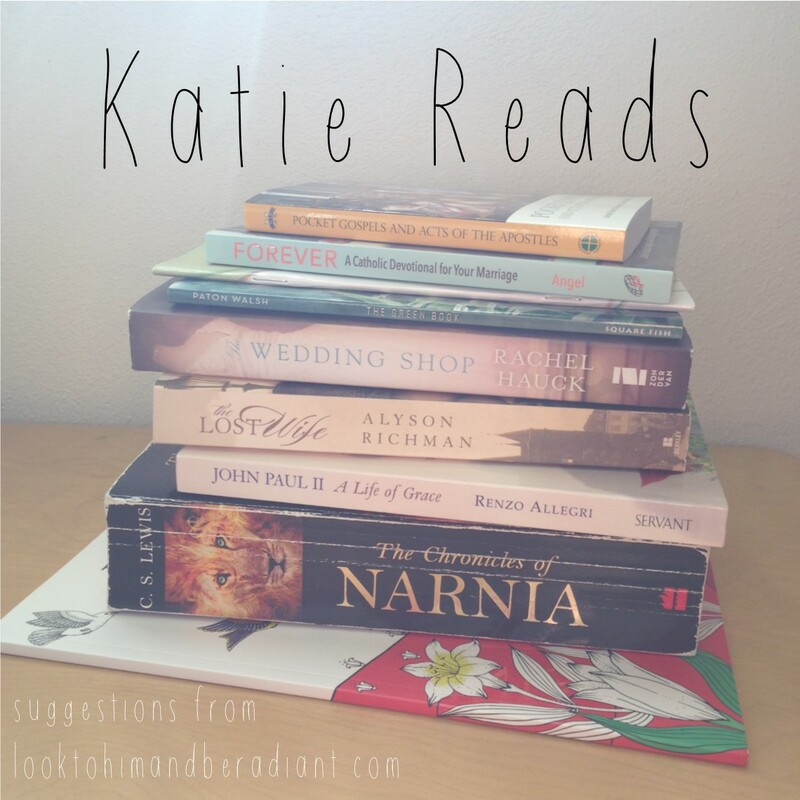 All of the books in this series are a sweet reminder that God isn't ever done with our stories. This was another rummage sale find. I had seen it on book lists from other readers that enjoy WW2/Holocaust fiction, so I thought I'd give it a try. Loosely basic on a real event, this novel tells the story of a young couple in Prague who marry quickly before inevitably being separated due to events of the war. Another major plot point is the underground art community run during the war, even in Auschwitz, and how the desire for sharing beauty transcends the worst of circumstances. While this book wasn't bad, it just doesn't stand out to me in the genre compared to books like All the Light We Cannot See, The Nightingale, and others. Definitely worth it for quarter I paid for it, but not my favorite. Ahhhhhh, Narnia. It does my heart good just to think about the Pevensies and Aslan. I actually never read the Chronicles of Narnia as a kid, but after discovering what I was missing, I now pick up my giant compilation about once a year and read/reread one or two books in the series. As I was prepping for the beginning of school and exhausted, I went back and revisited The Lion, the Witch, and the Wardrobe as well as Prince Caspian. 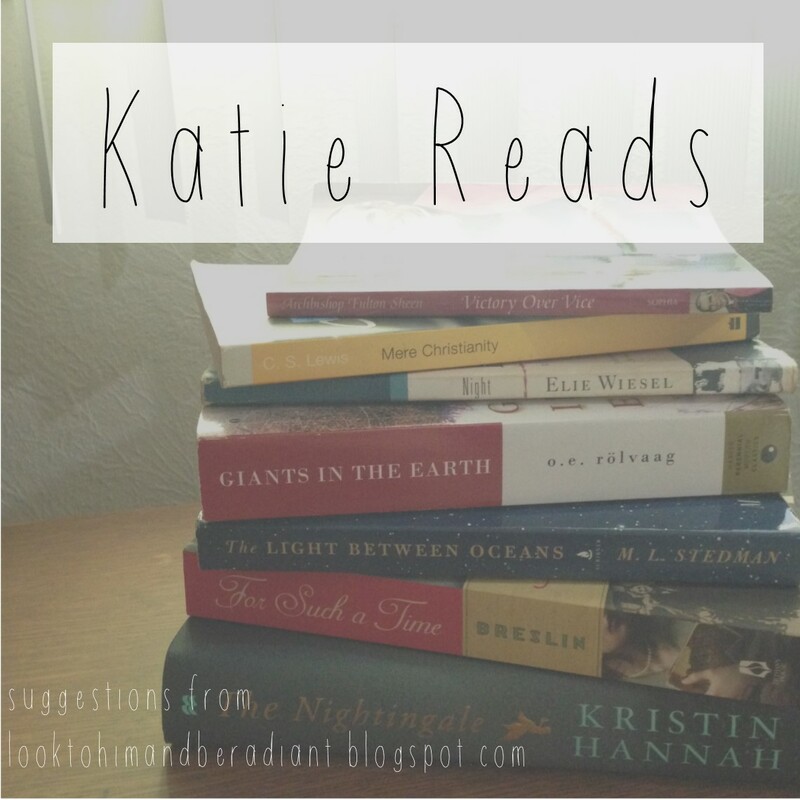 This isn't the typical kind of book that I share in Katie Reads, but after finishing my read-the-Bible-in-almost-a-year and posting about it (here and here), I have received a lot of questions about Bible journaling and study. If you are looking for a way to try out some of the great study and journaling tips that are out there, this little pocket Gospel might be a great fit! I actually ordered a set of these Bibles, which have the four Gospels and Acts of the Apostles, as part of the back to school gifts for my catechists. Our CCD theme is about valuing and learning Scripture, so I gave them one packet Gospel to keep and one to give away to someone. This pocket Gospel is offered from the USCCB. It has the same cover art that was on a pocket Gospel that was passed out at the Vatican by Pope Francis. It is a great size and the text is plenty big enough to underline/highlight/etc. If you are looking for a Bible to give to your study group/mom's group/volunteers/coworkers/etc. or if you would like to try a Bible highlighting or study system but don't want to commit to the whole Bible, this might be a great fit! Pauline Books & Media provided me with a copy of Forever in exchange for an honest review. This might seem like a strange book for me (a single gal) to review, but as someone who desires this vocation and is surrounded by those living out the Sacrament of marriage, it makes sense to read and study and know about more than just my own life experience. This brand new devotional was written by speaker Jackie Francois Angel and her husband Bobby Angel compiles six weeks of reflections, quotes, prayer, and practicals for any couple at any stage of a relationship. More than just a relationship book, this is a little power-packed collection of wisdom about Theology of the Body shared one snippet at a time. It would perfectly set the stage to start a dialog that could only make any marriage stronger. Pauline Books & Media provided me with a copy of The Beatitude Explained in exchange for an honest review. This little book on the Beatitudes is part of Pauline Books & Media's Explained series (with books also on The Ten Commandments, The Creed, and The Works of Mercy). I hadn't seen any of them before, and I am impressed- I might need to pick up the rest of the series! The Beatitudes Explained contains 64 full color pages outlining Christ's teaching at the Sermon on the Mount. Usable for intermediate or middle schoolers, the text is rich but attainable and is well organized to either use as a resource book or to read from cover to cover. If you are looking to move away from your traditional text for a unit on the Beatitudes, a class set of these would be awesome. Containing detailed explanations of each of the Beatitudes and their practical implications in the lives of kids, there are also discussion/reflection questions, Saint quotes, and tie in stories from Scripture. It is graphically interesting with illustrations as well as pop in boxes with connecting info. 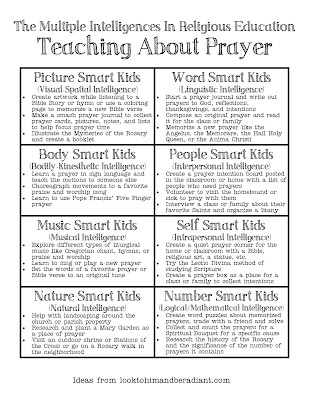 I'm glad to add this resource to my classroom faith library and think it would make a nice addition to your home as well! 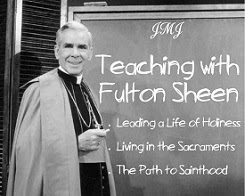 It might be just the beginning of the new school year, but it won't be long before we are rolling into a new Liturgical Year. One of my favorite parts of being Catholic is living out the beautiful rhythm of the Liturgical Year. The fasts and feasts, the orderly-ness, the life of Christ lived out in the Church- every Catholic can benefit from making the Liturgical Year more a part of their prayer and daily life. So with that background, I hope you understand why I am so excited about this resource for the new Liturgical Year. 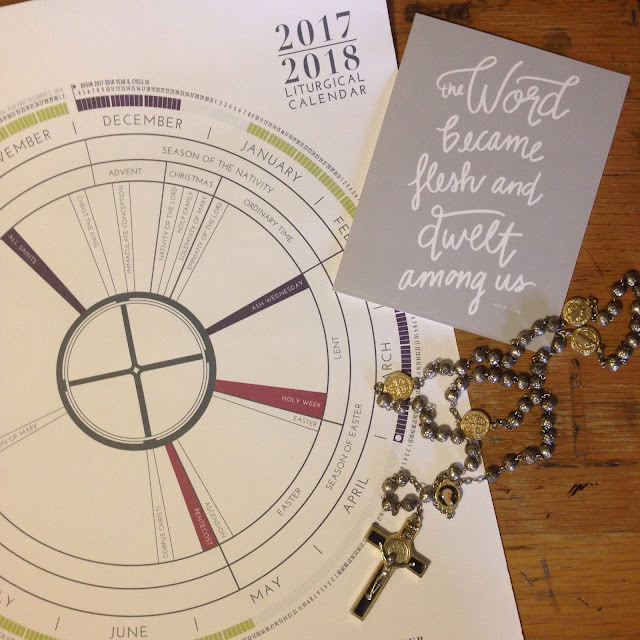 TelosArt has created a set of simple, but beautiful, Liturgical Calendars for the 2017-2018 year. 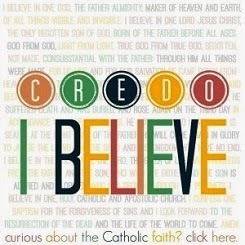 This calendar would look lovely hung up in a home as well as in a school classroom, CCD room, RCIA meeting place, etc. It is usable and attractive both for kids and adults, and packs tons of info within the clean design. Liturgical seasons, dates, colors, feast days, and more is included on each calendar. *TelosArt provided me with a free 2017-2018 Liturgical Calendar in exchange for an honest review. I only recommend things that I have used and love, and these opinions are entirely my own. I love that this Liturical calendar isn't filled with cartoony illustrations or bright colors, making it difficult to decorate with anywhere but in an elementary classroom. Instead, this calendar fits anywhere you'd like to add a reminder of the Liturgical Year. Above you can see my temporary display (I'll find a permanent spot when the calendar actually starts with the first Sunday of Advent) including some art for the Saints of the month or the Season. 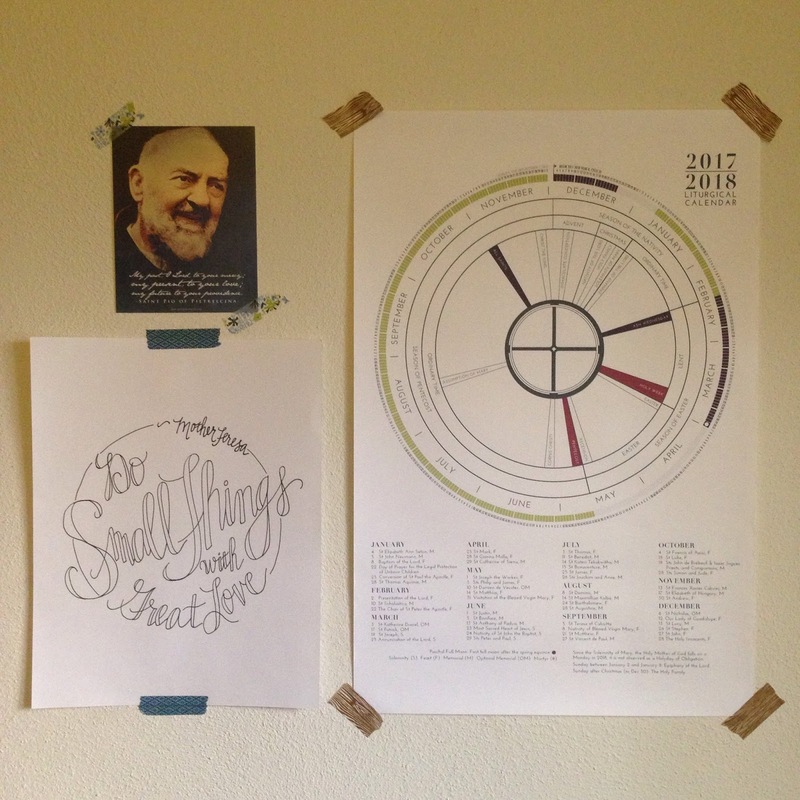 Here I'm celebrating the September Saints of Mother Teresa (printable here) and Padre Pio (postcard from here). I think when I hang my new calendar in December, I'll continue to rotate out quotes and images to remind me of where we are in the Liturgical Year. For more photos and examples of all the calendars TelosArt offers, visit their website here. You can also find them on Etsy and Peter's Square. 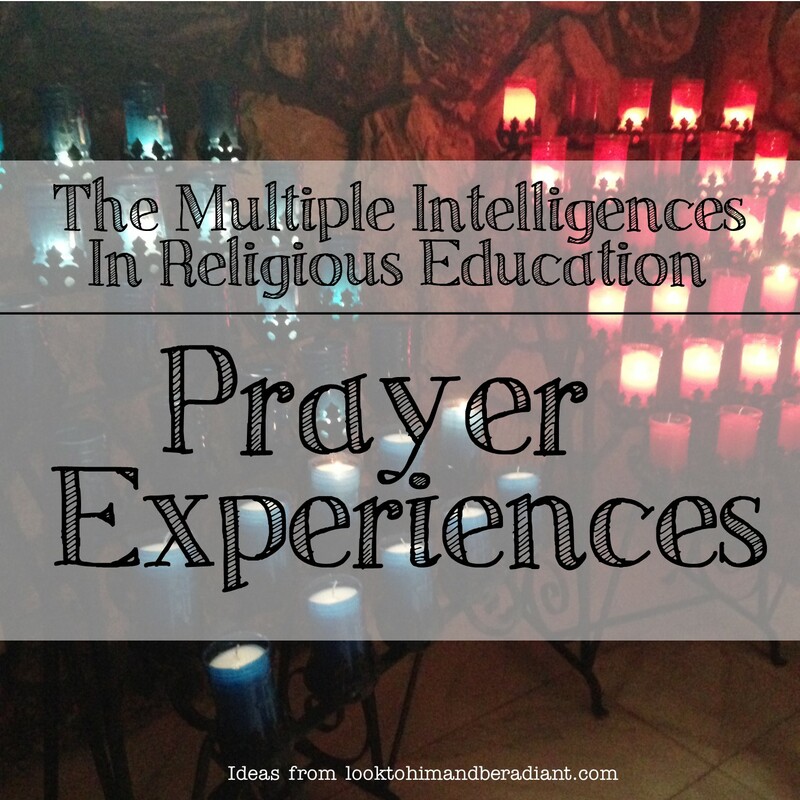 As a teacher and DRE, I was also interested in getting these into our classrooms and the homes of our parishioners. TelosArt was very gracious about working with us to make it affordable to buy multiple copies of the calendar for schools and parishes. You can view their bulk pricing here and contact them for more info. I'm excited thinking about this new addition to my personal Liturgical living, as well as for all the ways I plan to use this calendar in my classroom. Go visit TelosArt and see if their Liturgical Calendar could find a happy spot in your home or work!